A postcard of the hotel during the Weiss family’s early days in Asbury Park. Olga Weiss Hipschman was a senior in high school when her parents bought Hotel Altman in Asbury Park in 1947. It was the beginning of a long and joyful saga. She and her husband helped run the renamed Weiss’s Altman Hotel as a kosher establishment, and brought up their four children there. “My daughter says she grew up like Heloise,” said Hipschman, now in her 80s and a resident of Ocean. If the little fictional child had a wonderful time at the Plaza Hotel in New York City, so too did the Hipschmans, along with their cousins who came to Weiss’s on vacation all those years, until the family sold it in the mid-1960s. A huge part of the pleasure was the food, so much so that when Hipschman decided seven years ago to write a memoir, she knew it had to include lots of recipes. 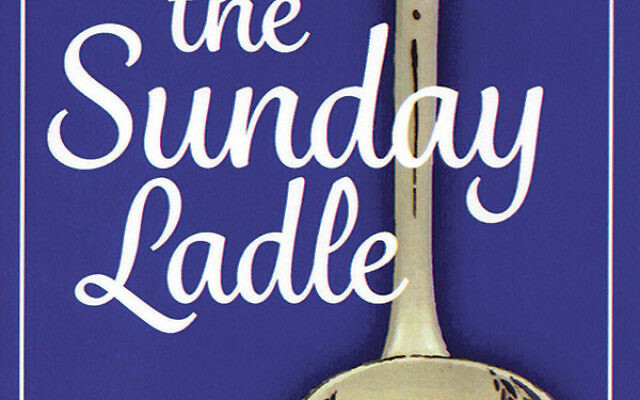 The result is The Sunday Ladle: Hungary to Cuba to America: A Love Story With Recipes. The slender volume is based on her parents’ love story and filled out with the dishes that went with each chapter of their lives, and each season. They include the Hungarian dishes the two of them grew up with, the Cuban ones they learned while in Havana en route to America, and various others gathered along the way as they raised their family. The dishes range from goulash cholent to black bean soup, chicken paprikash to arroz con pollo, guava compote, hallah, and coffee dumpling cake. Few were written down before, Hipschman told NJJN; she learned most simply by watching her mother. The basic story starts in Hungary with a “White Knight” riding up on a horse to the humble home of a farmer. The young man, Nicolas, sees a lovely young woman, Maria, and asks for a drink of water. 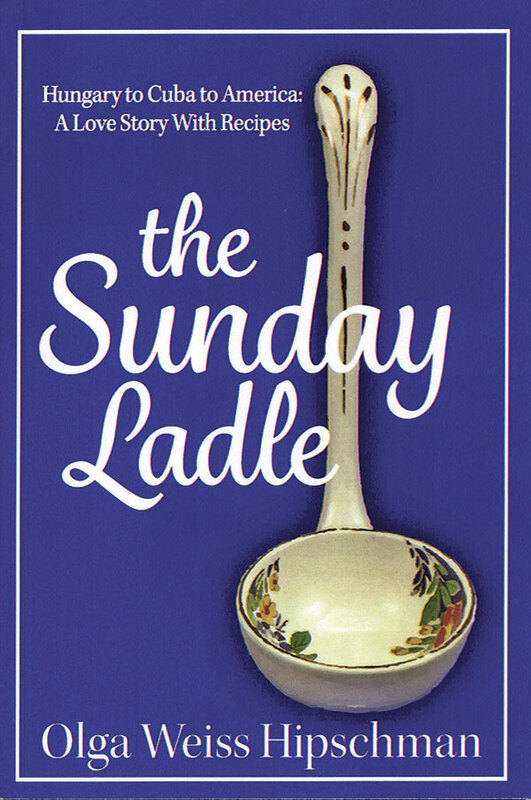 With heart pattering, she gives it to him in the style of her family — from the treasured ceramic “Sunday ladle” of the title. And he rides away. That might have been the end were it not for the extraordinary twist of fate that brought their paths together about three years later halfway across the world — in Cuba. Maria, who was Catholic, had gone there with an uncle because her father had died and her mother was moving into a new home with her second husband. Nicolas, whose family was Jewish, had gone in search of a better life. His family perished in the Holocaust; hers survived, though she didn’t see them again for decades. Olga and her siblings learned the story from their father. “He was a great storyteller. That entertainment would be our dessert at the dinner table. My mother would listen, smiling quietly.” The two Hungarian youngsters went from Cuba to the Bronx, where they ran a little candy store; to Manhattan, where they helped run a restaurant and a night club; to the Catskills, where they ran a small hotel; and finally to Asbury Park, to Altman’s. Maria took to Judaism and to kosher cooking with eagerness, her daughter recalled. Shabbat and holiday services were conducted in the hotel, and they had two Torah scrolls and an ark specially built to hold them. After the hotel was sold, Hipschman went back to school and became a nurse. “I was an RN for 40 years,” she said. But the skills and the traditions celebrated by her parents are still a big part of family life, even with the children grown and scattered — two in New Jersey, one in California, and one in Florida. “All the siblings and all the children love cooking,” Hipschman said. She told just one more: how her father would get up every morning before 5, join the baker in the kitchen, and put up a big pot of coffee. “Around 8 o’clock, he would bring my mother a fresh cup of coffee with a fresh baked roll and butter, as she was waking up.” That rising might have been leisurely, but it was the last time her mother rested till after dinner. It was a tough life, Hipschman recalled, but one that she remembers with undimmed delight.